As a little boy, all I knew about golf was that you got to drive a golf cart around. So since my driving experience back then was rather limited, golf carts were awesome reflexively making golf awesome. Today, I finally tried golf. My uncle is an avid golf player and a couple of my friends also golf. The past few months, I have been becoming more and more interested in trying out my hand at golf. I talked to my uncle about it and he said he would find me a good set of left-handed clubs to buy. So last week he found a complete set of clubs and a USC bag for me. We scheduled today as my first day of practice. I met up with my uncle, and he showed me how to properly hold the club and the basic rules of golf. Then he had me practice some putting on the carpeted floor. From there, we headed off to Sierra Lakes Golf Club which was pretty nice. The main items on the agenda for the day were to get me some putting and driving practice. At first, putting was hard for me. I had no clue how much of a swing was needed for certain distances. Then my shots were getting sliced as my clubface was sometimes open or closed. But finally, I started getting the hang of it and the golf balls started rolling towards the holes. I struggled again at first and in all honesty I had two air shots added to my record. But my uncle was there to explain what I was doing wrong and to show me how to correct the errors. After hitting about 20 balls, I was hitting 200 yds with my 3-wood and shots were fairly straight about 70% of the time. It felt good. I definitely need tons of practice, but since I am finding golf to be fun, there will be little motivation needed for me to practice. 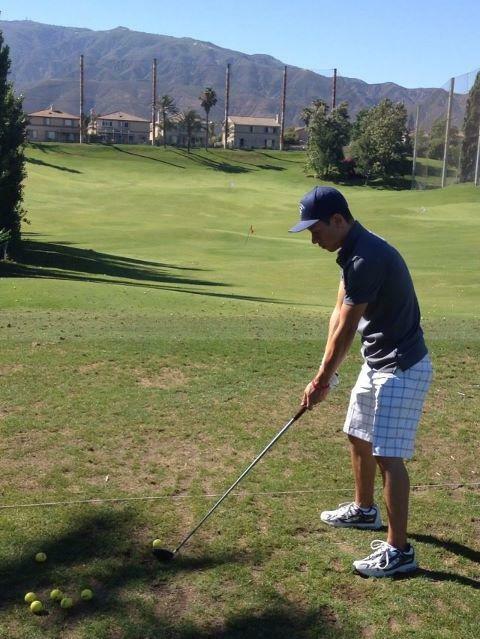 It was actually relaxing to be out on the range and to just swing that golf club. My hectic life needs to include some relaxing activity, and golf is stepping up to assist with that.